Harm Reduction Archives | Central Coast Senior Services, Inc.
Tips-to-Protect-Against-Elder-Fraud Elder financial abuse costs older Americans more than $2.6 billion per year. Follow these three steps to identify and protect against elder fraud. Rights of the Elderly We are all entitled to basic rights, regardless of age. Elder abuse is grossly under reported. If you need guidance on how to report elder abuse please call Central Coast Senior Services, Inc. at 831-649-3363, and we will guide you in the right direction. Aging and Adult Services: The Aging and Adult Services Branch provides health and social work services to seniors and people with disabilities. Their mission is to empower and serve the aging population and persons living with disabilities to live safely in their homes and with dignity. The goal of Aging and Adult Services is to delay or prevent inappropriate institutionalization of seniors and people with disabilities. This goal is achieved through the delivery and coordination of home and community based services. The Alliance on Aging is a private, non-profit organization in operation since 1970, with a mission to provide services and resources that promote optimum independence, dignity and quality of life for all Seniors in Monterey County. Legal Services for Seniors: Senior Citizens can be the most vulnerable segment of our population, often falling victim to unscrupulous business dealings, governmental mistakes as well as serious physical and financial abuse. Legal Services for Seniors, a non-profit 501(c)(3) law firm, helps Monterey County senior citizens with many legal matters. 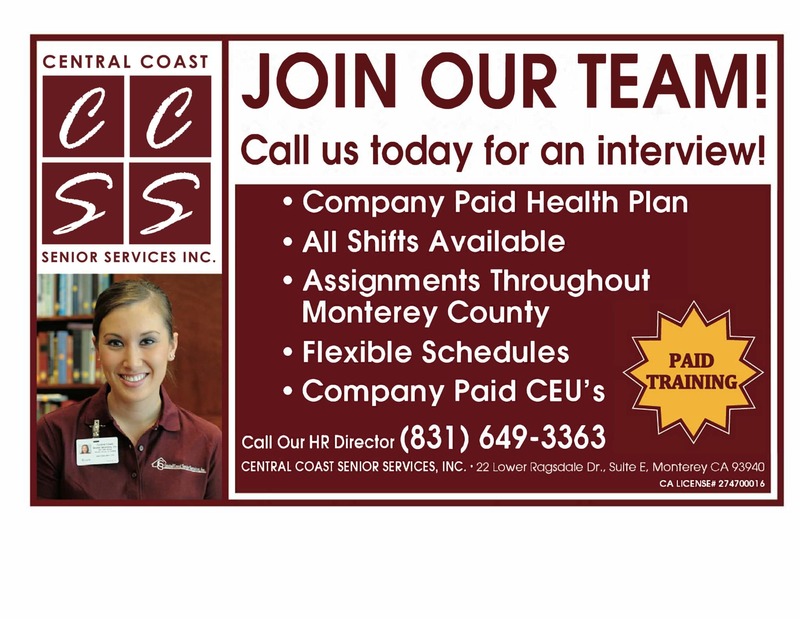 Copyright © 2019 CENTRAL COAST SENIOR SERVICES, INC. All rights reserved. HCO License 274700016.